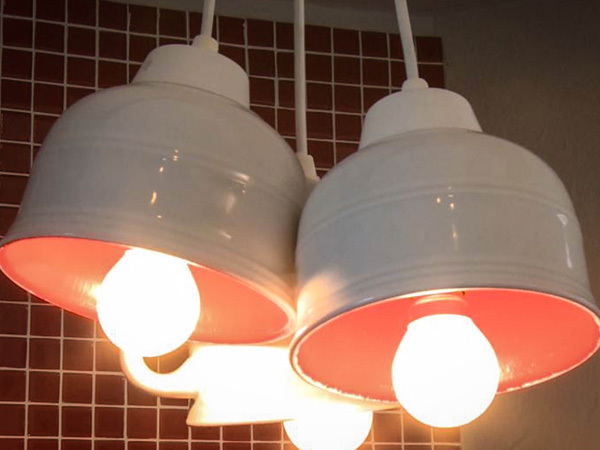 Make the ordinary into something extraordinary by transforming a coffee mug or teacup into a stunning light fixture. Drill a hole for the electrical cord in the bottom of your mug or teacup. Remember to use a diamond-core drill bit when working with glass or porcelain, as it’s rather fragile. Add a bit of water to keep dust at bay and to keep the drill bit cool. Make sure the teacup is dry and dust free. Coat the interior of the mug with a multisurface primer. Apply with a brush or sponge roller. Allow for one to two hours’ drying time. Before applying the non-drip enamel paint (in the colour of your choice), make sure the primer is dry. It’s advised to paint two coats of the enamel with between two to three hours’ drying time between coats. Once your second coat is dry, simply thread through the light fitting and have an electrician connect the light to power.